With New Snapshot you can:Capture Students' interest and imagination though real characters and language, and up-to-the-minute teenage topics. Bring language to life. Widen students' experience of international culture through new culture pages, new projects and a new teenage lifestyles video. Provide extra support with the unique Language Booster - a Workbook and Grammar builder in one, now with Boost Your Writing sections to improve students' performance in the skill area. Solve the problem of mixed ability classes with exercises at three levels of difficulty in the Language Booster. 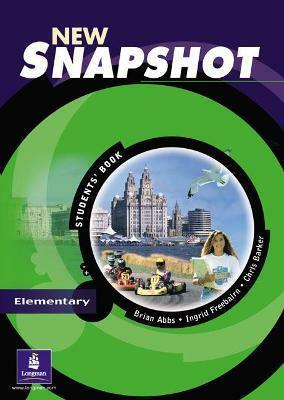 Brian is a well-known writer of many series of best-selling ELT text books, mainly co-written with Ingrid Freebairn. He is most famous for titles such as Strategies, Discoveries, Flying Start, Blueprint, American Blueprint, and most recently, the original Snapshot.In the course of his long career, Brian has been active in the Society of Authors and professional ELT organisations. He has taught and lectured widely in Europe, the Middle East, the Far East, Australia and Latin America. He now lives in London where he concentrates on producing materials for ELT.Chris Barker has developed materials for the teaching of foreign languages in Britain and has written materials for magazine-based English teaching. He worked with the British Council teaching English at the University of Belgrade, where he was involved in syllabus design. He has also taught ESL, EFL and Adult Literacy in Britain. Ingrid Freebairn has worked in ELT since 1978 as a teacher, teacher trainer and writer. She is co-author with Brian Abbs of the following Longman course books: Strategies, Discoveries, Blueprint and Snapshot. She also co-authored with Hilary Rees-Parnall the Grammar ROM and the FCE Grammar ROM, also published by Longman. In the course of her work, Ingrid has travelled widely in Europe and Latin America.